J Surianata; K Edwards; D Graham; Harry Searle; W Parmenter; PBI President A E Brown; Registrar J Giblett; Mrs Giblett; Principal Dr E G Gibson; E Mullins (Councillor); Mr Snowball (Councillor); ; P Bailey; J Lydon; B Jenner. PBI Cook: Mrs Jarick; G Samuel; A Prosser; B Pritchard; M Hadlow; M Muir; V Keen; F Paterson; J Gwynn; J Hainsworth; I Wesley; A Pritchard; P Burvill. M Snell; A Penn; F Holland; G Broooks; R Gwynther-Jones; G Thomas; R Bennett; J Lin; W Nash; W Grosser; G Houghton. Looking at photos with my Mum and Dad. Thank you for the wonderful memories. 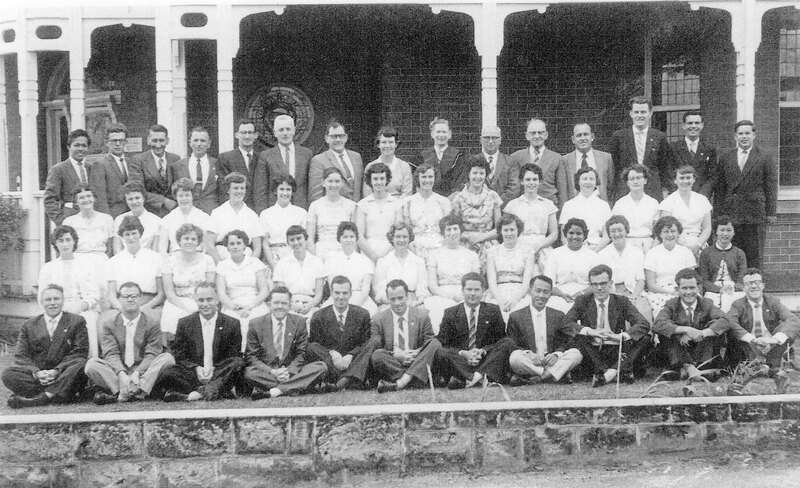 Dad is sure that this photo the 1959 class has a mistake. The gentleman in the back row, number 5, next to Mr Brown is definitely Mr Parmenter, not number 4 as shown. Thank you for all the wonderful work that has gone into preserving these photos for everyone s pleasure. Thanks Leanne! You are right. I will put a gap at number four until I find out who it is on the left of Wilf Parmenter.